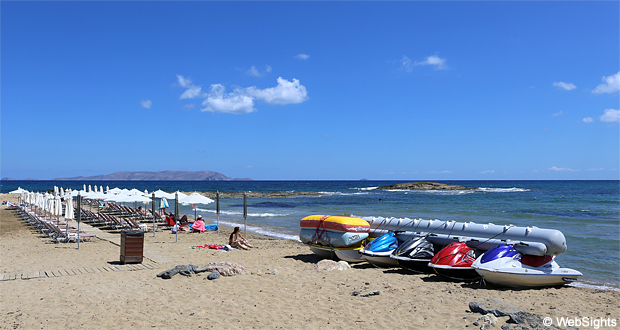 Vathianos Kambos is located on the north coast of Crete, approx. 14 km from the capital, Heraklion. The town is named after the village Vathia, which is located further to the south. 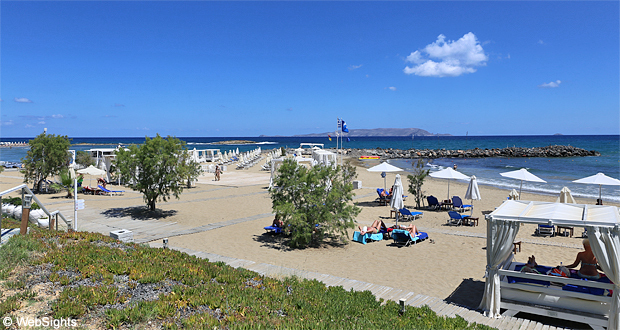 Vathianos Kambos has three main beaches with a short distance between them. All three beaches offer the usual facilities, such as sun lounges, sunshades, showers and toilets. The biggest beach is located to the west of the large hotels and mostly has visitors coming by car. A giant sand beach with lots of room, but also more noise from the motorway than the other two beaches. The other two beaches are located in front of the two largest hotels in town. The beach near the Arina Beach Resort is quite narrow, but nice and with relatively shallow water. 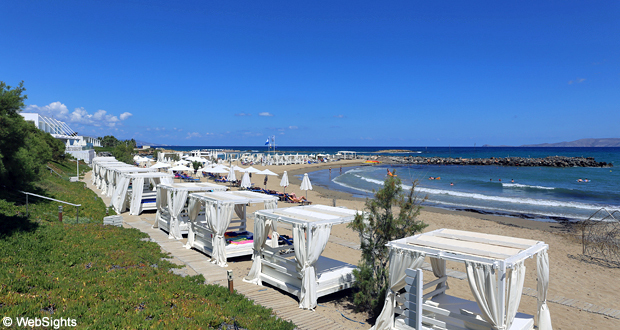 The most beautiful and luxurious beach is located in front of the 5-star Knossos Beach hotel. The area is all dressed in white and couples can treat themselves with a double luxury sun lounge with soft mattresses. The breakwaters in front of the beach ensure that the water is relatively calm. All three beaches has fine-grained sand and the water is shallow enough for children. In general, the beaches are quite child-friendly, however, there are often big waves. On days with waves, it is better to visit the beaches near the hotels. There is a rich variety of water sports activities at the hotel beaches. Here you can try jet skis, water skis, banana boat and parasailing. If less action is required, you can also rent water bikes. You will find a restaurant at all beaches. The restaurants near the hotels lie above the beach and has a magnificent view of the beach/sea. 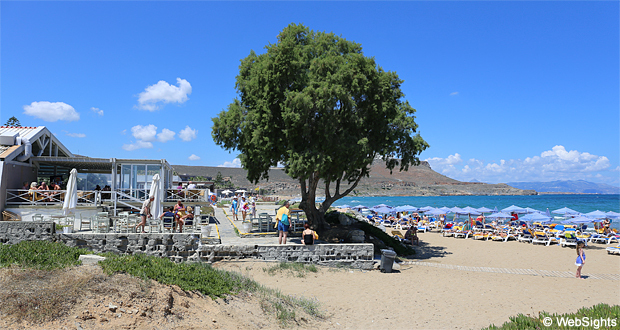 At the large beach west of the hotels, you will find a plain beach café. 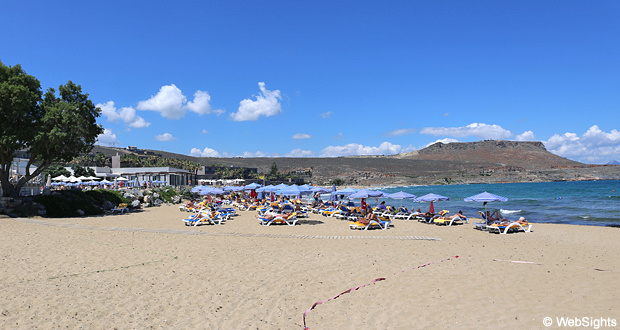 Vathianos Kampos mainly consists of two large and a number of small hotels. The town is laid out around the main road and here you will also find some restaurants and tourist shops. 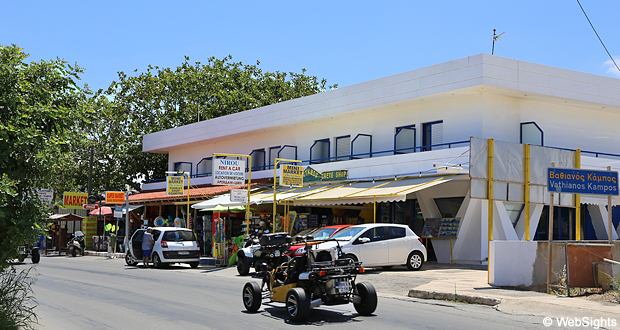 The next town, Kokkini Hani, is within walking distance and here you will find even more restaurants, tourist shops and supermarkets. A nice place to go for an evening walk. Only three kilometres from Vathianos Kampos, you will find the Watercity Waterpark. A nice water part with slides and swimming pools for children of all ages. Families will have no problem spending an entire day here. 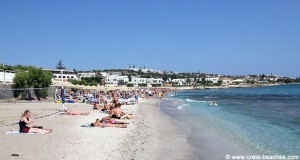 The large beach can be seen on the left side of the map, the beach near the hotel Arina Beach Resort is in the middle, whereas the luxury hotel Knossos Beach is on the right side of the map.